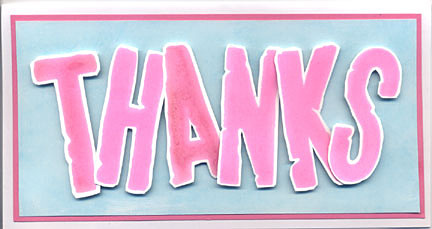 It is easier to send a card to say "Thanks" than to write a long letter of appreciation. There are lots of greeting cards in the shop that will help you convey your gratefulness but I always prefer to make my own if I have some available time. Somehow, recipients find these handmade cards more endearing and precious and will treasure and keep them. I received many of these homemade cards and it always give me a beautiful warm feeling every time I receive one because I consider the time and effort my friends put into making these cards. Here's one simple card I made using Making Memories foam stamps - Jersey Alphabet Stamp Set. To express your appreciation, sincerely and without the expectation of anything in return. Truly appreciate those around you, and you'll soon find many others around you. Ink foam stamps with pink dye ink and stamp on white cardstock. Trim around each alphabet leaving a white border. Trim and layer onto the white blank card. If you do not have the right shade of pink color cardstock, just sponge the same pink dye ink onto the edges of a white cardstock. Simply rub the ink-pad directly onto the white card. You can do the same for the light blue card but you will have to cover the whole card. Spend at least one day a week or, if not possible, a month thinking of those who have contribute to make our lives easier and better. Write a note to let each person know what you are are thinking and tell them how grateful you are for their care, thoughtfulness and contributions. Whether it's a simple note card, a double-fold card or a more complex three-panel card, what's important is that you pen down your thought and feeling and let the other person know. I believe if we do this, the world will be a better place and people around us will surely be happier especially if more people practice this. So let's at least attempt to do this once a month even if you could only send out one card, it should be better than not doing so at all. I promise you that you yourself will be a more joyful person too. Is there anyone you would like to make and send a card to now?